On THE Dress: Before we went dress shopping, my mother bought several wedding magazines and passed them on to me. I found an amazing dress in Southern Weddings: The Libertine by Ian Stuart. I called my mom as soon as I saw it and told her I had found my dress. She asked me to describe it and said, “When I saw that dress, I knew it was the one for you.” I called several stores trying to locate a sample in blue and we went to see it a few days later. Since I had chosen such a distinctive dress, I decided to keep it a secret from everyone except my parents until the big day. On the morning of our wedding, I had the photographer and videographer capture my bridesmaids’ reactions to my dress. I love the idea of an Adventure Book for your marriage, what a sweet way to join bucket lists, and create a life of complete adventure. How well this would go with our Up! inspired guestbook thumbprint balloons as well! Did you decide to do a “first look”? Why or why not? We decided to stick with tradition and not do a first look. I am glad we made that decision because my favorite part of our wedding video is seeing my 6’8” husband stand on his tiptoes trying to see me above the crowd before I walked down the aisle. The finished guestbook fingerprint tree in our beloved twisted oak design by BDT Handmade. For more details, visit Southern Weddings Blog. Celebrate with vino: The guestbook perfect for your vinyard wedding! Be one of the first to use our fun new design! Perfect for wine lovers, enthusiasts or a vineyard or winery location wedding! 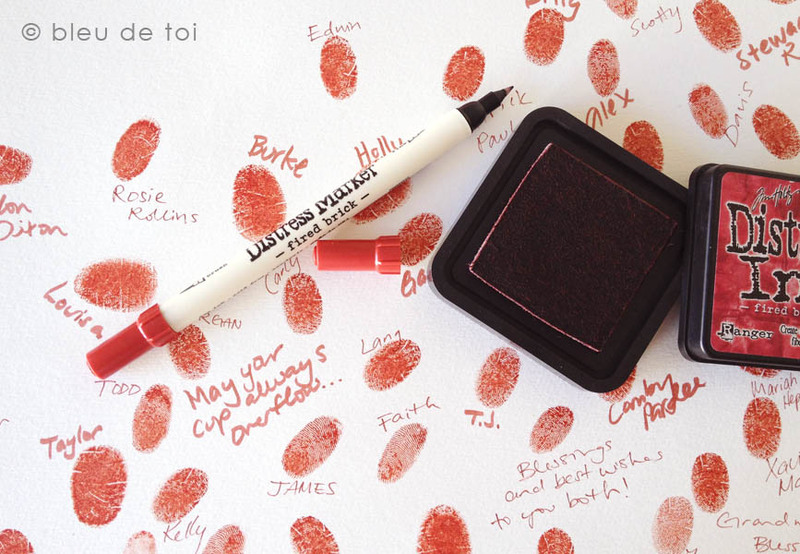 Leave an impression of a memorable day with a unique way to record your guests! 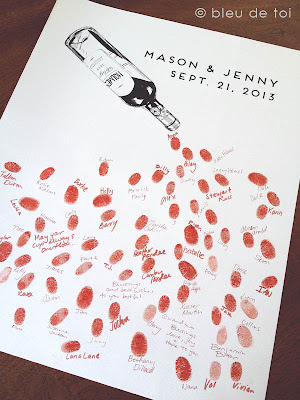 Inspired by our guest book fingerprint trees and balloons and champagne bottle design, the red wine bottle playfully makes each guests a bit of that beloved red nectar! Interactive, creative and a beautiful keepsake for you to have for years to come! What is a celebration without wine? 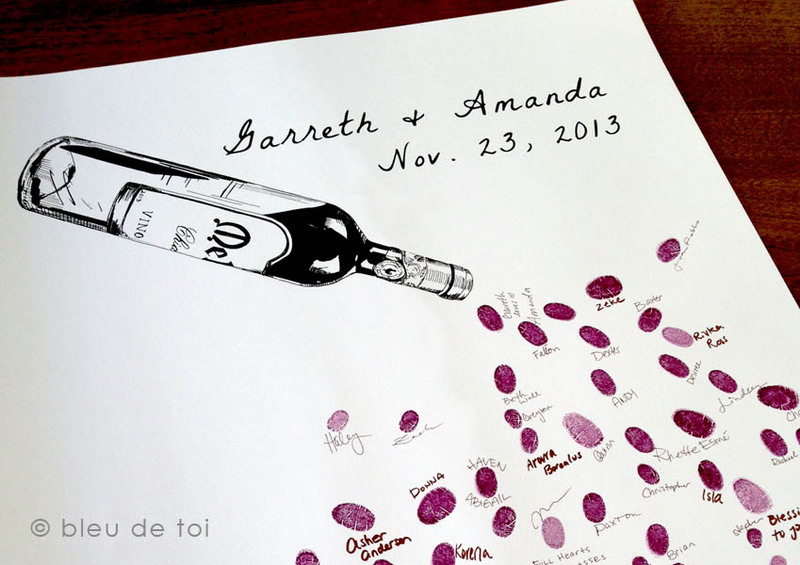 Each guest wine bottle design is customized for showers, family reunions, festivities and the happy couple. 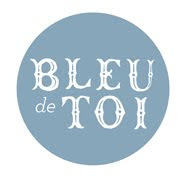 Order in the general wine label design or have us custom design a label with your name and event location details on it. Once you give us your label text, we will work up a design using text that suits the letters and length of your text. 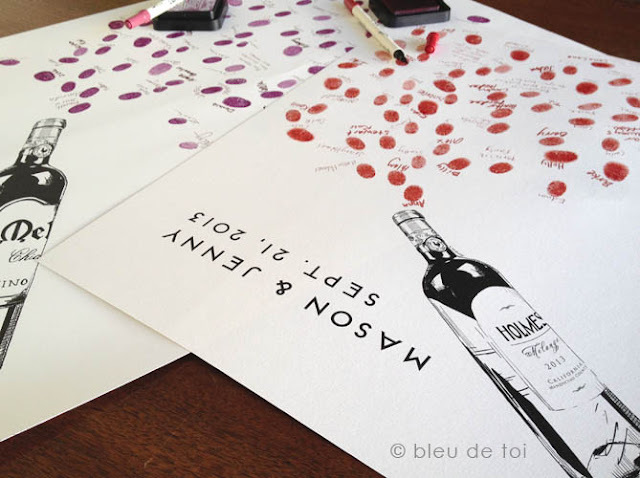 Then we will send you a sample of the label before adding it to the bottle drawing. 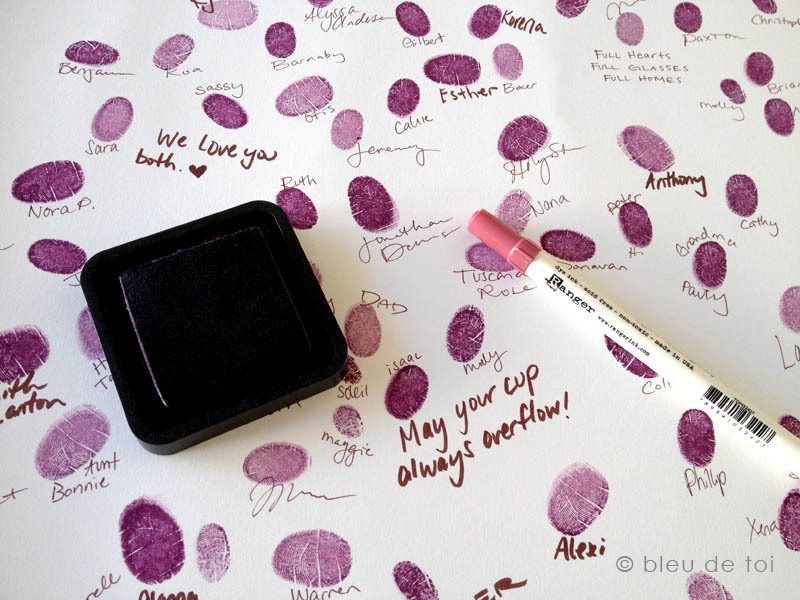 Each of the guests leave their thumbprint or fingerprint pouring out of the open bottle and sign their name using the included coordinating pen. Signatures and messages in the same color add to the effect. The pen is two sided (one side with a brush tip and the other a fine point, for variety). Choose a jammy purple with aged mahogany pen or brick red with same pen. Personalize the text and font at the time of purchase. Names and date, or alternative desired text, is placed at the top right of the drawing. One ink pad included, just let us know which color you like. This is our only product with which a deluxe pen is included. Please convo for larger sizes. 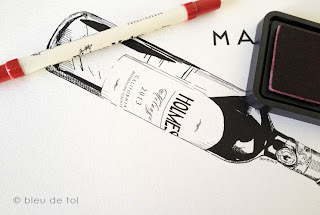 The drawing is on fine artist grade paper with archival, fade-resistant ink.